High Speed Blowers Market size was over USD 750 Million in 2017 and is projected to rise at a CAGR of over 4% over the forecast timeframe. High speed blowers market will be mainly driven by the rapid increase in the environmental concerns waste water treatment, which is mainly due to stringent regulations imposed by the regional regulatory bodies. Waste water released from the households and industrial sector leads to clogging and impurifying the water bodies and therefore waste water treatment becomes a necessity to keep the environment as well as the aquatic life healthy. In these previous years there has been a drastic increase in the product use for wastewater ventilation. Several centrifugal blower manufacturers are developing and marketing high-end high-speed turbo blowers. These blowers possess substantial benefits over traditional blowers, i.e. wider operating range, greater efficiency, minimum operating sound and highly integrated and uncomplicated instrumentation and controls. The conventional roller bearings cannot withhold the industry standard bearing life. However, the modern High-Speed Turbo (HST) blowers, which rotate from 15,000 to 50,000 RPM are efficient in waste water treatment which results in converting released waste water from household & industrial sector to consumable water. Various industry players in Germany, France and Italy are making significant investment to develop technologies for the waste water treatment due to scarcity of clean water in the region. High product price and its complex operations may prove to become a hurdle in the growth of the high-speed blowers market size in the forecast timespan. High product prices are mainly attributed to its ability to attain high efficiency and elevated aeration speed which is likely to hinder the turbo blowers market size in the coming years. Furthermore, its complex functioning requires trained personnel for its handling, which may obstruct the high speed blower market size over the forecast spell. However, extensive product use in oil & gas industry for high speed aeration and strong demand for clean water will uphold the high speed blowers market size in the forecast timespan. 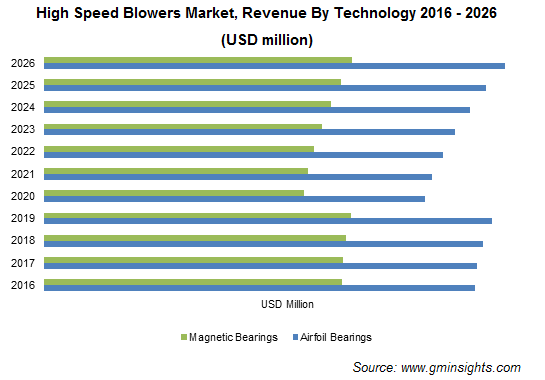 High speed blowers market for airfoil bearing technology accounted for more than 65% of the overall turbo blowers market in 2017. Product with airfoil bearings are used for applications with light load and constant speed requirement. Various centrifugal blower manufacturers including Hamilton Standard, Honeywell, Mechanical Technology, Sunstrand, ABG-Semca and Tupolev made significant effort to improve its design, in order to escalate its anti-friction foil coatings, load capacity and enhanced stability under shock loads. Airfoil bearings are the preferred choice for plant designs with continuous operation having less start or stop cycles and clean air supply. The abovementioned trends are probable to make noteworthy contribution to the overall high speed blowers market size in the near future. High speed blowers market for oil & gas industry was more than USD 195 million in 2017. The product is widely used across oil & gas industry for aeration in hydraulic power stations and cooling pumps. The product is used for ventilation in the refining furnaces by combustion of air supply for cracking and reforming processes. Moreover, product is widely applicable for temperature control operations in the air-cooled heat exchangers which helps in reducing the water temperature in petrochemical industry. According to International Energy Agency (IEA), countries including the U.S., Russia, and Norway are producing more than 190,000 barrels per day since 2017, which is projected to grow significantly and henceforth will help attain promising gains to the turbo blowers market size in the near future. 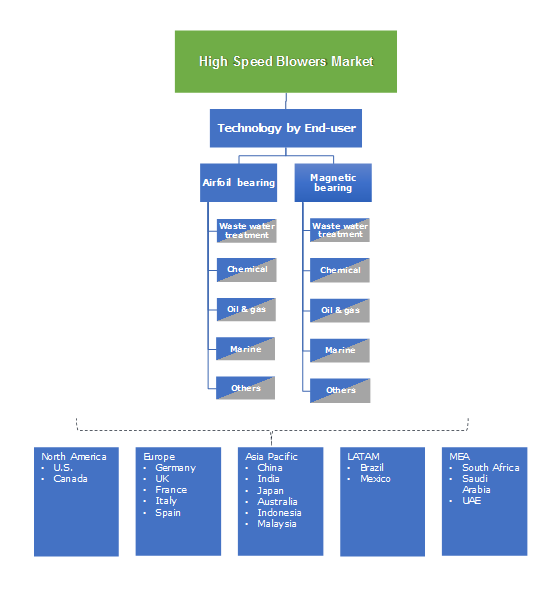 Europe high speed blower market share accounted close to 35% of the global volume in 2017, owing to the rising wastewater treatment process which is due to stringent regulations imposed by environmental regulation bodies in the region. In the past years, droughts have drastically increased in the European nations affecting 11% of their population and presently 17% of its areas are affected by water insufficiency till date, which further propels demand for clean water in the region. European Union (EU) and the United Nations (UN) together has launched Strategic Implementation Plan of the European Innovation Partnership on Water (SIPEIPW) to maximize reuse of water and henceforth wastewater treatment for its usage as non-potable water. The strategy targets to provide a substantial increase in its level of water by 2030 with increase in the number of wastewater treatment facilities which would directly boost the turbo blowers market size in the projected timeframe. The high speed blowers market share is competitive and the share is divided among various large and medium scale market contributors. Some of the major high speed blowers market share contributors are Atlantic Blower, Atlas Copco, HSI Blower, Xylem India, Zi-Argus, Eminent Blowers, Spencer Turbine, Aerzen Turbo Division, APG-Neuros and United Blower Co., LLC. The key turbo blowers market players are making considerable investment in their R&D facilities to launch new product and therefore expanding its product portfolio to acquire a competitive edge over its competitors globally. For instance, Atlas Copco launched a new high-speed turbo blower named ZB 250 in December 2015. The new technology provides wastewater aeration basins with high efficiency air and features a two-pole permanent magnet motor with rare earth element magnets. High speed blowers have an extensive application in the wastewater treatment industry. It provides high speed efficiency with low energy and maintenance costs compared to conventional blower technologies available in the market. The product is mainly sorted according to its bearing technology i.e. airfoil bearing and magnetic bearing. Wastewater treatment requires mainly airfoil bearing turbo blowers as it requires continuous air flow. In the oil & gas exploration activities, magnetic bearings are used as they are capable of processing heavy loads with speed of more than 25,000 RPM. Rising oil & gas extraction globally and increasing awareness for wastewater treatment will help augment the high speed blowers market size in the near future.